Rural Chinese households are characterised by significant gender differences; men are more influential than women, and the genders also differ in the way they make decisions. Relative status is important to Chinese farmers. For women, spending money on clothes, restaurants and mobile phones signals status; mobile phones serve the same function for men. All of this is found in a new doctoral thesis from the School of Business, Economics and Law at the University of Gothenburg. 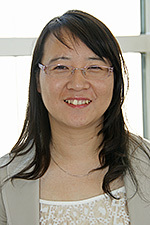 Xiaojun Yang’s recently presented doctoral thesis is a study of gender-related issues among rural Chinese farmers. Her economic experiments focused on two topics: household decision-making and the farmers’ views of status and consumption. ‘Some of the subjects made more patient and consistent decisions when they were made jointly. Yet a surprisingly large proportion displayed the opposite behaviour – they made worse joint than individual decisions,’ says Yang. When one spouse makes decisions for the other, there are generally small differences in the decisions made. Yet men tend to make more patient decisions than they expect their spouses would have made in the same situation. ‘Given the importance of Chinese consumption for the global environment, the Chinese society should acknowledge how decisions are made in Chinese households. Stronger women would help strengthen the welfare of households. Chinese authorities should also increase the general support concerning gender issues in order to improve the economic situation of households over time,’ says Yang. Rural Chinese households are relatively poor. Yet the issue of relative status and income is very important. As regards status items, certain types of consumption stand out. ‘For women, status is linked to the household’s expenditures on clothes, restaurant visits and mobile phones. For men, mobile phones are important. The study shows that houses and cars are not very important for somebody’s status,’ says Yang, who believes that these findings may be of interest to the Chinese government’s redistribution policy in terms of taxes on income and consumption. The thesis was written with support from Sida’s environmental economics capacity-building programme. Thesis title: Household Decision Making, Time Preferences, and Positional Concern: Experimental Evidence from Rural China.